Johannes Gutenberg died in 1468, a little over a decade after inventing moveable type. But he had already set in motion a gold rush-like frenzy of European entrepreneurs who flung open print shops to cash in on his technological earthquake. This printing fever may be as responsible as Gutenberg's press itself for igniting the transformation that followed — the Reformation, the Scientific Revolution and the Industrial Age, according to new research published by the London School of Economics (LSE). 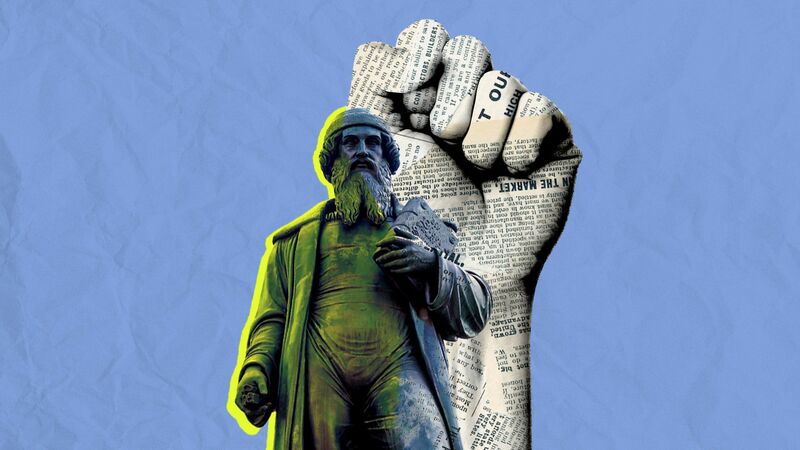 Why it matters: We may be seeing the echoes of Gutenberg in the political and social tumult all around us, Jeremiah Dittmar, lead author of the article and a professor at LSE, tells Axios. Today's competition for people's attention in the torrent of digitized information — blogging, the 24-hour broadcast news cycle and online commentary (not to mention email newsletters) — may be a key driver of the chaos. The big picture: Competition was everything to the Gutenberg revolution, Dittmar and co-author Skipper Seabold wrote on their blog and in a longer paper in January. From there, the ideas of Protestantism spread and radical societal and business reform followed. Municipal Reformation laws followed, suggesting a link between the spread of printed material and political upheaval. Paul Starr, a professor at Princeton and author of the forthcoming book "Entrenchment: Wealth, Power and the Constitution of Democratic Societies" warns against "technological determinism." Similarly, O'Mara says that, in both the case of Gutenberg and today, public faith in institutions had grown thin. "Even the most transformative technology doesn’t operate in a vacuum," she says. "New media propels political turbulence because of instability or loss of public faith in underlying institutions." Over the last three years, the pay gap between American men and women shrunk by just 3 cents, per a new study from Glassdoor. Erica writes: Women went from earning 76 cents to a man's dollar to 79 cents. But, in some jobs, that gap is even wider. In industries where men generally outnumber women — like construction and energy — the pay gap tends to be more stark, says Glassdoor economist Daniel Zhao. “The media industry continues to see roles that are dominated by men, including highly visible roles like anchor and editor,” says Zhao. And media — like all industries — is adding scores of tech jobs, which is exacerbating pay gaps. “Common occupations include editor, producer and account executive, but also software engineer and game artist. This is an example where tech jobs with big pay gaps are spreading to other industries,” Zhao says. While traveling through Chicago's O'Hare Airport last week, I saw the above sign. The airport has an apiary with some 75 beehives and 1 million bees. It began in 2011, and it may be the first at a U.S. airport, but it's a trend. While we're fumbling for our licenses and passports in long check-in lines at the airport, travelers in China are just walking up to a camera. Erica writes: China tech analyst Matthew Brennan encountered one of the machines at Chengdu Shuangliu International Airport. He filmed himself walking up to it, and in just a few seconds, the image recognition software pulled up all the details of his flight and checked him in — with just his face. Worth noting: This technology might seem a bit unsettling, but it has already arrived in the U.S. The Department of Homeland Security has been testing facial recognition at airports for years, and Delta Airlines' systems in several airports scan travelers' faces for check-in and boarding. Watch the Chinese machine in action.